The Forum for Agricultural Research in Africa (FARA) jointly with the West and Central African Council for Agricultural Research and Development (CORAF/WECARD), the North Africa Agricultural Sub-Regional Organisation (NAASRO) and the Council for Scientific and Industrial Research (CSIR) of Ghana are organising a Regional Consultation on rolling out the Science Agenda for Agriculture in Africa (S3A) for countries in Central, West and North Africa. The Consultation will take place at the FARA Secretariat in Accra, Ghana. Participants are leaders of National Agricultural Research Systems of the following countries; Comoros, Djibouti, Equatorial Guinea, São Tomé and Príncipe, Somalia and Sahrawi Arab DR, Algeria, Egypt, Libya, Morocco, Tunisia, Benin, Burkina Faso, Cameroon, Cape Verde, Central African Republic, Chad, Congo Republic, Côte d’Ivoire, Gabon, Gambia, Ghana, Guinea, Guinea-Bissau, Liberia, Mali, Mauritania, Niger, Nigeria, Senegal, Sierra Leone and Togo. Other participants include the African Union Commission, ECOWAS, COMESA, IGAD, EAC, UEMOA and CGIAR centres. The Science Agenda is a framework for deepening the application of Science to accelerate the transformation of Agriculture in Africa with the ultimate goal of achieving sustainable inclusive growth, shared prosperity and poverty reduction as encapsulated in the Comprehensive Africa Agricultural Development Programme (CAADP). It refers to the science, technology, extension, innovations, policy and social learning Africa needs to apply to meet its evolving agricultural development goals. The S3A is based on the recognition of the game-changing potential of science to transform agricultural development. Its goal is the realisation of the CAADP target of doubling agricultural productivity by 2025. In 2012, the African Union Commission (AUC) and the NEPAD Agency mandated FARA (their technical arm on agricultural research matters) to coordinate the development of a Science Agenda for Agriculture through a consultative process that cultivated African ownership of the product. The S3A was endorsed by the African Union (AU) Joint Conference of Ministers of Agriculture, Rural Development, Fisheries and Aquaculture in April 2014 and subsequently by the AU Heads of State and Governments in their June 2014 Malabo Declaration on Accelerated African Agricultural Growth and Transformation. It was launched in Johannesburg in November 2014. The S3A’s vision is that “By 2030 Africa is food secure, a global scientific player, and the world’s breadbasket. The S3A amongst other things advocates for a doubling of public and private sector investment into agricultural research for development (AR4D) by 2020 (the baseline being 2014). Realisation of the Science Agenda’s vision depends on effective domestication of this framework into national strategies, investment plans and action plans given the uniqueness of the contexts, challenges, opportunities and priorities of countries. To ensure that the S3A is owned and driven by countries, a series of engagements at Sub regional and National level are being organised by FARA, AFAAS and the sub regional agricultural research organisations i.e. ASARECA, CCARDESA, CORAF/WECARD and NAASRO, to launch a controlled process for deepening national engagements with S3A implementation by countries. So far two regional consultations have been held. The consultation for Southern African countries was hosted by Malawi from the 10th – 12th April 2017 and the consultation for East and Central African countries was hosted by Rwanda from the 19th – 21st April 2017. The consultation for Central, West and North African countries will crown the regional consultations and pave the way for a series of more in-depth consultations in selected countries. We wish to thank the government of Ghana for supporting the rolling out of the S3A across the continent by accepting to host the regional S3A regional consultation for Central, West and North African countries. 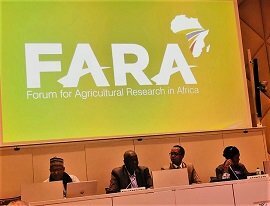 FARA is the apex continental organization responsible for coordinating and advocating for agricultural research for development. FARA also serves as the technical arm of the Africa Union Commission on matters concerning agriculture science, technology and innovation.